You only have 3 seconds to grab the attention of your online shopper. Studies have shown that if a website page doesn’t load in 3 seconds, 57% of shoppers will move on to another site. After 8 seconds, 47% will not only leave, they will never return to your brand. And every second of reduced load time could get you a 7% increase in conversion. Most eCommerce sites use up to 50 third party applications to provide richer experiences for their shoppers. These applications, such as live chat, personalization, ads, and social media channels, are essential in terms of building brand loyalty and engaging customers. While third party applications provide better shopper experiences, they also significantly affect the performance of eCommerce websites. Why? Today’s sophisticated retail websites are heavy with an average of 220 calls to 80 servers for every page. Purpose-built to solve the performance challenges ecommerce websites face today, Yottaa’s eCommerce Acceleration solutions enable online businesses to significantly improve website performance across all devices resulting in higher conversions. Yottaa’s eCommerce Acceleration Platform enables online retailers to significantly accelerate website loading and improve end user experience resulting in fast ecommerce websites and dramatic online revenue increases. Combining proprietary “InstantOn” technology, application sequencing, 3rd party application control, and security, the Yottaa ecommerce platform increases page load speed on all assets, pages, and devices instantly. Real-time alerts and analytics provide you the visibility and control needed to limit performance and scalability impacts due to 3rd parties or malicious traffic. The platform also offers Content Delivery Network services. Yottaa’s Rapid CTRL allows you to have both fast website performance while providing engaging shopper experiences through rich third party applications and content. 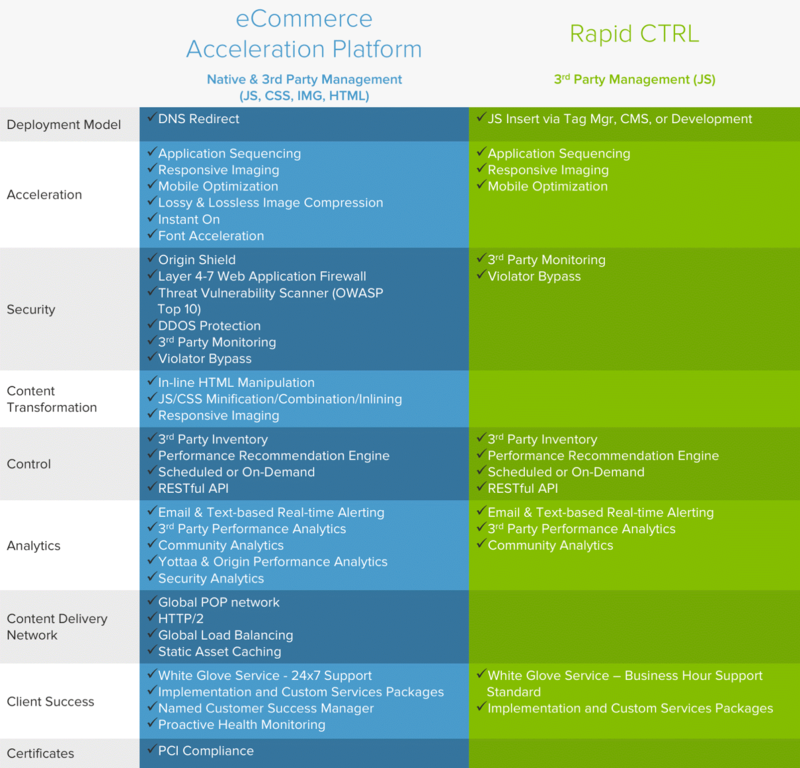 Combining acceleration, third party control, actionable analytics, and simple deployment, Rapid CTRL enables you to accelerate, optimize, and sequence your ecommerce site in a matter of hours. The end result is reduced third party violations, thousands of hours of time saved, and increased conversions.